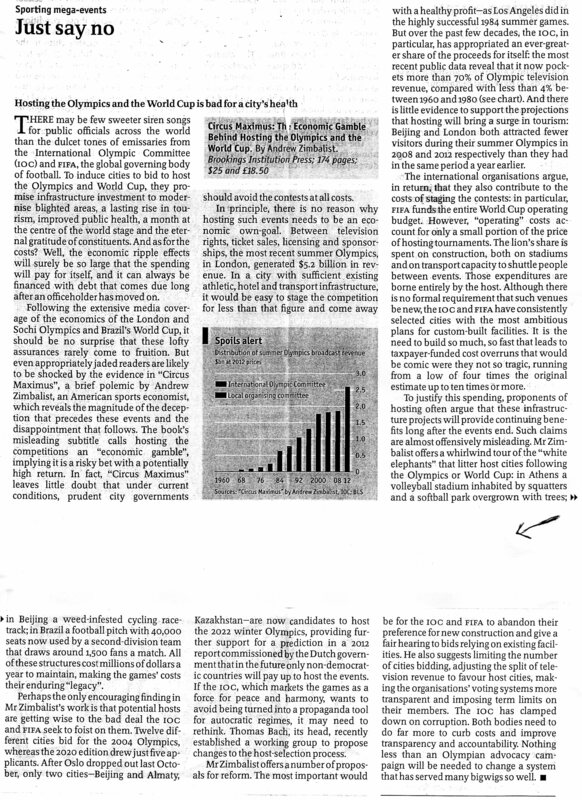 The Feb. 28 Economist article (below), “Hosting the Olympics and the World Cup is bad for a city’s health,” explains who is really paying for the new infrastructure built to host the games (taxpayers!) and who is really making the majority of the profit – I’ll give you one guess, that’s right, the IOC [International Olympic Committee] and FIFA. Seeing the precedent of economic disadvantage for both the London and Sochi Olympics and Brazil’s World Cup, Tokyo would be making a huge mistake in hosting the 2020 Olympics. The article states, “But over the past few decades, the IOC, in particular, has appropriated an every-greater share of the proceeds for itself: the most recent public data reveal that it now pockets more than 70% of Olympic television revenue, compared with less than 4% between 1960 and 1980… And there is little evidence to support the projections that hosting will bring a surge in tourism: Beijing and London both attracted fewer visitors during their summer Olympics in 2008 and 2012 respectively than they had int he same period a year earlier. Rather than digging itself into deeper debt by spending billions of dollars on sports facilities, Tokyo must funnel maximum resources into the Fukushima Daiichi decommissioning efforts and compensation for the ten of thousands of displaced Fukushima refugees. I use the word “efforts” because no one truly knows how to deal with the situation — three reactors with spent melted fuel that cannot be located due to extreme radiation levels; about 1,300 storage tanks full of contaminated water, up to 333 of which are leaking; the risk of sinking foundation due to underground water, which also becomes contaminated; and 300 tons of radioactive water flowing in the Pacific Ocean daily since March 2011. The list goes on. Japan seems to have its hands full with an estimated several trillion dollar cleanup process and recovery that will take a minimum of 40 years. Rather than looking out for the safety of its citizens, the Japanese government has literally done the opposite by increasing the annual radiation limit from 1 mSv to 20 mSv and by threatening evacuees to move back to contaminated areas where evacuation orders have been lifted. They are given a set number of months to return home until they can no longer receive compensation. I’m talking about mothers who fear radiation exposure for their families every day and children who can’t even play outside for more than a short period of time before they’ve reached their daily radiation capacity. The Japanese government has shamed and dishonored its country by denying its citizens their basic needs for survival and happiness and the freedom to raise their families in a clean environment. Instead, its marriage with utilities and energy companies has pushed nuclear energy to the forefront of Japan’s energy policy, a slap in the face to the survivors of the Fukushima triple meltdowns. Tokyo must step down as host of the 2020 Olympics for the social and economic welfare of Japan. The new political development in Japan could remind the responsibility of the IOC [International Olympic Committee] to have been influenced by the lack of understanding of the real situation of the Fukuichi. I am attaching below my letter sent to the Washington Post last September. Tepco announced yesterday that contaminated water is flowing into the sea from the trenches at Fukuichi, due to the failure to freeze the water. The situation is dangerously worsening. The IOC continue to ignore Dr. Helen Caldicott’s legitimate request to send to Japan a team of independent scientists to reasure the safty problem. The credibility of the IOC is at stake. I am informing you of an important initiative taken by a Swiss friend of mine, Mr. Andreas Nidecker, Co-Founder of IPPNW-Switzerland in response to my message attached below. It is very timely and its impact will be extensive. Mitsuhei, reading Your description of the current events in the Fukushima Nuclear Power Plant I am as alarmed as You about the worsening situation: the failure of the „freezing concept“ of TEPCO for the underground water flow indeed may facilitate a lasting increase of the Pacific seawater contamination, which is of global concern. You are also absolutely correct in Your assessment, that the Internatl. Olympic Cttee should seriously consider withdrawing the 2020 Olympic Games from Japan. By Your previous political position You have a close connection with our country, Mitsuhei. We activists in Switzerland and in many countries are involved in a politically tenacious and difficult struggle to get our Nuclear Power Plants phased out. I therefore propose to You, Jean Jacques, to publish Mitsuhei’s letter to the Washington Post in Swiss Newspapers, translated into German obviously. Other IPPNW affiliates may also decide to do the same. Best regards and thanks for Your continued efforts to stand-by in observing the evolving disaster in Fukushima and report about it. The worsening situation at Fukushima Daiichi has some experts fearing the worst; collapse of the 4 reactor buildings due to the softening of the soil caused by excessive underground water. It could be the beginning of a catastrophe for Japan and the world. Experts say within weeks a radioactive plume could reach the West Coast of the United States. The total volume of cesium 137 of the Fukushima Daiichi is equivalent to 5000 Hiroshima Atomic Bombs. The release of their total radiation could bring about the nuclear winter that would fatally affect the United States for hundreds of years. The dangers are real and incomparably terrifying than many are led to realize by Tokyo Electric Company (Tepco) and the Japanese Government. Fukushima is forgotten, but the reality remains; Fukushima is a global security issue. Japan knows more than any other country the real and present dangers of nuclear reactors. It is a serious security problem that the mainstream of the world continue to promote nuclear power generation even after Fukushima, totally ignoring its lessons. The problem of protecting the security of the residents of the US West Coast will soon awaken the world to the uncontrollable and spreading consequences of the Accident. We cannot deny that Fukushima, if badly managed, could become the beginning of the ultimate global catastrophe.